'H' for handling pack; 'G' for greatness. Wonderful though it is (and it is truly wonderful), one of the Ferrari 599's characteristics is that it's no easy machine to drive near the limit. At times you almost feel that it's calling as many shots as you are. An Aston Martin DBS, even the dynamically weaker Merc SL65 AMG instil more trust in their driver, and move more sedately at the point where grip ends and handling begins. So, Ferrari has chosen to make a few choice changes to the 599, via an optional HGTE package, to make the 599 more controllable and exploitable to drive fast. Obviously, the key letter in the pack is H, for Handling; GT stands for, er, GT, and E for Evoluzione. The changes incorporate stiffer springs (17 percent front, 15 percent at rear), 10mm lower ride height, a stiffer rear anti-roll bar, and a softer compound for the Pirelli P Zero tyres that otherwise go unchanged, though they do run on front wheels that are half an inch wider than before. There's also a little extra camber and revised calibration for the magnetic dampers, to reduce pitch and roll, and improve grip and body control. Get into the HGTE and it feels like pure regular 599. There's an extra sprinkling of carbonfibre in the cabin, including the shells of the brilliantly supportive new seats, but there's little you couldn't tick as an option before. Mooch around town and the HGTE does feel mildly less supple than a standard 599, though it retains an ability to shrug off surface imperfections better than most supercars. This isn't a Scuderia or GT3 kind of set-up; it has a broader spectrum of ability. It doesn't skip or shimmy or crash, but matches superior body control (over the regular 599) with a deftness and delicacy that, say, really fast Porsche 911s (Turbo, GT2) can't match. It can take more throttle than before, and when it does break away, it's sweetly progressive and more confidence-inspiring. At Ferrari's Fiorano test track, the HGTE displays beautiful balance and feels more approachable than a regular 599. The engine is as wonderful as ever, of course. Power (456kW) and performance claims (a blistering 3.7sec 0-100km/h) are the same as a regular 599, though a few software changes have been made so the 599 shifts gears more adeptly and emits less carbon dioxide than before. All 599s benefit from this, but only HGTE pack buyers score new exhaust finishers, a matt diffuser, newly styled alloy wheels and a revised grille. Expected to cost around $30K when it becomes available in Oz next month, the HGTE pack will attract the "majority" of 599 buyers, says Ferrari. No doubt it will be worth it. 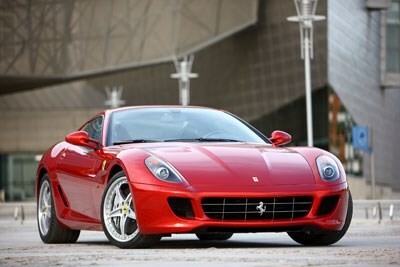 The HGTE package has done nothing to change the fact that the 599 is the best GT/supercar you can buy. In fact, it has just cemented its place at the top.